MUS offers several ways to stay informed. In addition to our web news and social media, we provide the following publications in print and digital formats. To download the digital versions of our publications, you will need to install the Adobe Acrobat viewer. 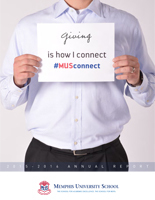 MUS Today, the school alumni magazine, includes feature alumni profiles, faculty and board accolades, and class news. Inside MUS is a quarterly magazine covering current school, student, and faculty news. The Inside MUS blog is another great way to stay current on the latest Owl happenings. The Annual Report is a presentation on the school's annual fund. This report includes alumni giving, an allocation of resources, a letter from the headmaster, and endowment totals.